It was such a privilege to craft the invitations for Defne & Ali, a Turkish couple who got married in Paris. 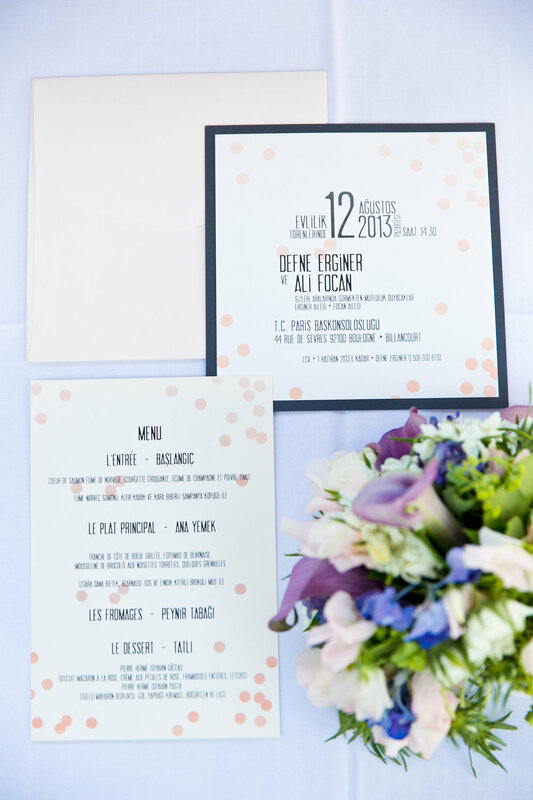 Invitations were in Turkish, menu cards were in French and Turkish. They chose the typographic confetti design from our selected examples page. Per bride and groom's request confetti colors were changed to pastel peach tones to match their wedding color scheme. Invitations were digitally printed on Lettra's 100% cotton paper, mounted on Envelopments slate gray card stock and sent ou to invitees in warm white envelopes. We were delighted to see these precious photos that bride & groom generously shared with us.